The chase is on in tonight's final round of Friday Night Fights: Boom!, where our host Spacebooger special rule is that every fight must contain an onomatopoeia. 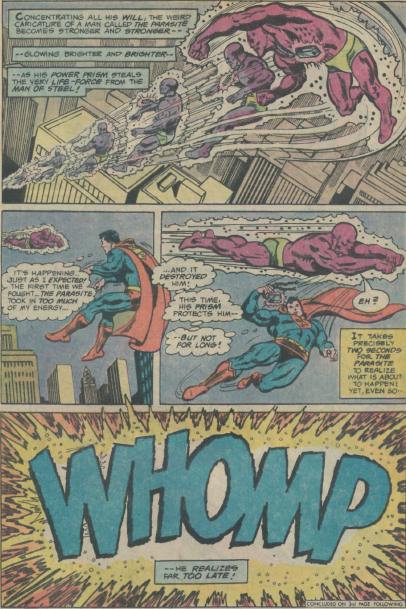 Tonight's fast-flying fracas comes from Superboy#239 by Paul Levitz, Jim Starlin, and Joe Rubinstein. Synopsis: Ultra Boy's been framed for murder, and the Legion Of Super-Heroes are arresting him for the crime. Only one problem: U-Boy isn't cooperating. 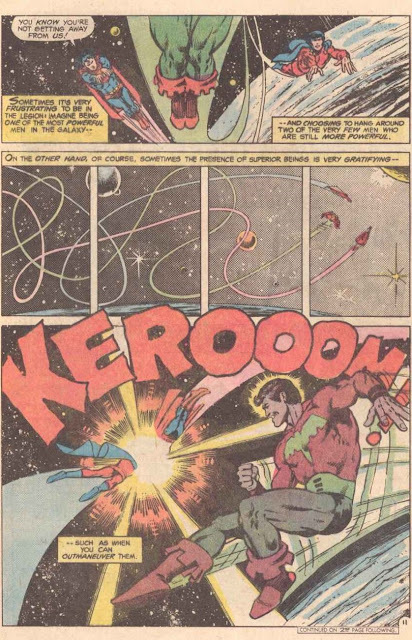 He fights his way through most of the assembled Legionnaires, only to be chased by Superboy and Mon-El. Tonight's Ultra-sonic fight music comes from KMFDM. For more super-speed slam-bang action, click here. And don't forget to vote! Friday Night Fights: Boom! - Round 10: Raining Hell(fire)! After being gone for several weeks, I'm back for another round of Friday Night Fights: Boom!, where the cardinal rule is that each fight must have an onomatopoeia, and tonight's fight ends in one which should sound familiar to Conan fans, even though it's from an X-Men comic. Tonight's high society hoedown comes from Uncanny X-Men#132, written by Chris Claremont and illustrated by John Byrne and Terry Austin. Synopsis: The X-Men infiltrate a Hellfire Club party undercover in order to learn about the group that's been attacking them lately. Spoiler: It doesn't go well. That little shirtless dude is the Hellfire Club's leader Sebastian Shaw. And this round will demonstrate what his power is. Tonight's fight music is by Pat Benatar. For more X-ceptional altercations, click here. And don't forget to vote!